The appearance of the 15th anniversary edition finally pushed me to take this book off the “to be read” pile, and I’m so glad. 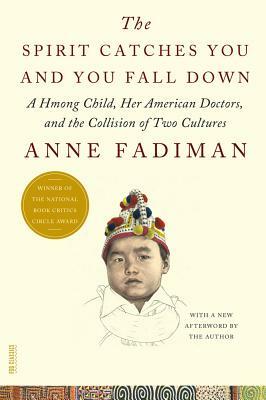 Fadiman’s book is a magnificent accomplishment: a multilayered, thoroughly researched story of a child, her family, their Hmong culture and its history; a severe medical condition and its physical and social ramifications; the clash of religious and medical traditions and beliefs – and all of it so absorbingly written that it will grip you at least as much as any thriller. Like all brilliant books, it challenges your belief system and enables you to experience another world. The Spirit Catches You and You Fall Down explores the clash between a small county hospital in California and a refugee family from Laos over the care of Lia Lee, a Hmong child diagnosed with severe epilepsy. Lia's parents and her doctors both wanted what was best for Lia, but the lack of understanding between them led to tragedy. Winner of the National Book Critics Circle Award for Nonfiction, the Los Angeles Times Book Prize for Current Interest, and the Salon Book Award, Anne Fadiman's compassionate account of this cultural impasse is literary journalism at its finest. Lia Lee died on August 31, 2012. She was thirty years old and had been in a vegetative state since the age of four. Until the day of her death, her family cared for her lovingly at home. Anne Fadiman is the author of The Wine Lover's Daughter, a memoir about her father (FSG, 2017). Her first book, The Spirit Catches You and You Fall Down (FSG, 1997), won the National Book Critics Circle Award, the Los Angeles Times Book Prize, and the Salon Book Award. Fadiman has also written two essay collections, At Large and At Small and Ex Libris, and is the editor of Rereadings: Seventeen Writers Revisit Books They Love (all published by FSG). She is the Francis Writer-in-Residence at Yale.